Do you want to adjust your screen brightness? Read on for information about picture adjustments in Office apps. You can change the brightness, contrast, or sharpness of a picture by using the Corrections tools. Click the picture that you want to change the brightness for. Under Picture Tools, on the Format tab, in the Adjust group, click Corrections. Depending on your screen size, the Corrections button may appear different. 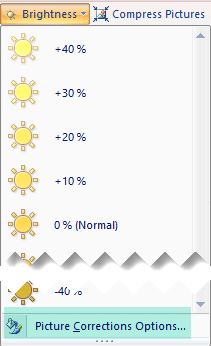 If you do not see the Format or Picture Tools tabs, make sure that you have selected a picture. You may have to double-click the picture to select it and open the Format tab. Under Sharpen/Soften, click the thumbnail that you want. Thumbnails on the left show more softness, and more sharpness on the right. Under Brightness/Contrast, click the thumbnail that you want. Thumbnails on the left show less brightness, and are brighter on the right. Thumbnails on the top show less contrast, and more contrast on the bottom. Tip: When you point at an option in the Corrections gallery with your mouse, the picture on your slide changes to give you a preview of the effect of the option you're pointing at. 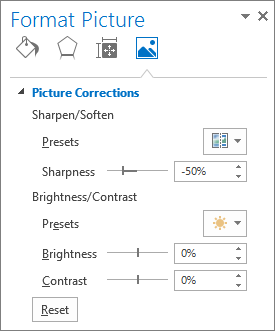 To fine tune any correction, click Picture Corrections Options, and then move the slider for Sharpness, Brightness, or Contrast, or enter a number in the box next to the slider. Note: If you are using PowerPoint, you can still save the original version of the picture, even if you have made corrections. This feature is not available in Word or Excel. Is the Office color scheme too bright for you? Do you need more contrast in the Office apps? See Change the Office theme (Office 2016 and 2013). 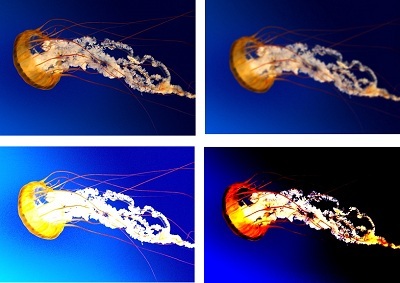 Clockwise from top left: the original picture, and the picture with increased softness, increased contrast, and increased brightness. Click the picture that you want to change the brightness or contrast for. Under Brightness and Contrast, click the thumbnail that you want. Tip: When you point your mouse at a thumbnail image in the gallery, the picture on your slide changes to give you a preview of the effect of the option you're pointing at. To fine-tune the amount of brightness or contrast, click Picture Corrections Options, and then under Brightness and Contrast, move the Brightness slider or the Contrast slider, or enter a number in the box next to the slider. Tip: If you are using PowerPoint, you can still save the original version of the picture, even though you have changed the brightness of your picture. This feature is not available in Word or Excel. Click the picture that you want to change the sharpness for. Under Sharpen and Soften, click the thumbnail that you want. To fine-tune the amount of sharpness or blurriness, click Picture Corrections Options, and then under Sharpen and Soften, move the Sharpen and Soften slider, or enter a number in the box next to the slider. Is the Office color scheme too bright for you? Do you need more contrast in the Office apps? See Change the Office 2010 color scheme. You can change the brightness or contrast of a picture. Under Picture Tools, on the Format tab, in the Adjust group, click Brightness. Click the brightness percentage that you want. To-fine tune the amount of brightness, click Picture Corrections Options, and then move the Brightness slider, or enter a number in the box next to the slider. Click the picture that you want to change the contrast for. Under Picture Tools, on the Format tab, in the Adjust group, click Contrast. 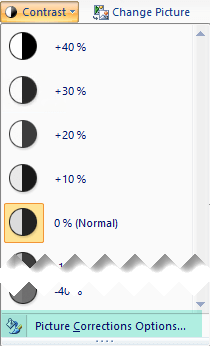 Click the contrast percentage that you want. To fine-tune the amount of contrast, click Picture Corrections Options, and then move the Contrast slider, or enter a number in the box next to the slider.